Up late tonight. Spent the better part of the last 8 hours setting up my new computer*. Lots of data to transfer around and all that. But fortunately there aren’t many new developments lately to talk about, so let’s go. I’m going to start with LightSquared. Out of the blue, it’s been repeatedly claimed that LightSquared is “the next Solyndra,” and that some nebulous form of corruption is somehow benefiting the company. Is it possible? Certainly. But I’d like to see some proof that LightSquared received actual benefits from the Obama administration, as Solyndra got free money from the government in the form of loan guarantees. No, I won’t accept proof that Barack Obama is a bad guy as proof that LightSquared had something going on. I’m playing the role of skeptic on this particular issue, because I don’t want it to be true. I want America to get more spectrum used for 4G wireless Internet, and I want us to have more national networks supplying 4G wireless Interent. LightSquared coming online would give us both, as LightSquared CEO Sanjiv Ahuja has said. LightSquared’s commitment to infuse $14 billion of private investment—without any government funding—into America’s infrastructure will bring 75,000 jobs over the next five years, competition, and innovation to the U.S. wireless industry, with affordable prices and better service for Americans everywhere. I hope you will join with us as we work to build the 21st-century communications network all Americans deserve. If actual corruption can be demonstrated, then I’ll drop LightSquared like a hot potato. But until then, I’m not buying the guilt by association that I’m seeing offered up. Oh, the administration offered advice on Congressional testimony? So what? Is there proof that there was some conflict of interest there? If so, please tell me. I mean that. LightSquared and I aren’t the only ones saying we need more spectrum, either. Everyone is, including CTIA. In Net Neutrality news, Kay Bailey Hutchison continues to target the FCC power grab, wanting to repeal it. I cheer this effort. Larry Downes ran the numbers on Net Neutrality and it turns out, unfortunately enough, that the regulations would actually diminish investment in spectrum, which is the exact opposite of what America needs. The Obama administration talks big on infrastructure, but in practice, they won’t let that get in the way of a power grab. The same holds true for the AT&T/T-Mobile deal, which would increase spectrum investment and national 4G wireless competition in America, but the power grab comes first with Obama and Eric Holder. Fortunately Republicans know better, including Tech at Night’s favorite Member of Congress, Marsha Blackburn, who joins John Shimkus, Adam Kinsinger, Steve Scalise, Brett Guthrie, and Phil Gingrey in urging “narrowly tailored” action on the merger. Todd Young has also spoken up, demanding information on why the DoJ sued to begin with. Good on him. Finishing the night with some intellectual property. The TEA Party Patriots have come out against PROTECT IP, the dangerous bill backed by the administration and Senate Democrats which would create a national Internet censorship blacklist, like they have in countries like Red China. The bill would threaten America’s tech leadership, as well as basic First Amendment liberties, so I also oppose the bill strongly. Copyright infringement is already illegal; we don’t need to give government even more power on that pretext. No more Internet Kill Switches. 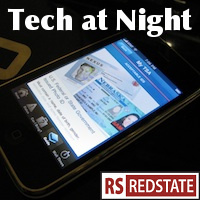 Some want to ban software patents. I’m not so keen on the idea myself, as I do believe some software-related patents are legitimate and serve a useful purpose. New, novel algorithms, such as those in the media compression field, are worthy of protection. They are genuine inventions. But for most software, my extensive experience in the field leads me to believe that most software patents are illegitimate, and copyright law should be used to protect software most of the time. * I know people will ask, so I’ll talk about it. I’ve upgraded from a 20.5″ iMac, dual core with 4GB RAM, to a 27″ iMac, quad core with 16GB RAM. My secondary display has also been upgraded from an old 19″ LCD, to a new 27″ Apple Thunderbolt display. Between the massive upgrades to RAM and display space, I’m going to be much more productive. Even if Firefox does gobble up 4GB RAM.